This is the sermon I preached on 9/30 at St. Timothy Lutheran Church. The text was James 5:13-20. These days, our public discourse, whether in person or via social media is ugly. People get angry at each other because they disagree on policies made by those in power. It’s taken so personally, that those claiming to be Christians wonder out loud or online if any they disagree with could possibly still be Christians. Especially in recent years, we Americans vilify each other over a host of topics. The book of James speaks volumes to our world today. James spends much of his time writing about speech and in this final section of the letter, that speech is specifically prayer. In this focus, the community of faith to whom he writes is called to wholeness. As we look at the first few verses, we see that James addresses people in all kinds of circumstances. No one is left out. If you’re suffering, you should pray. If you’re cheerful, then sing songs of praise, which is also a form of prayer. If you’re sick, there’s prayer for that too! There is also the call to confess our sins to one another and to pray for one another. James’ community of faith was being exhorted to form itself not around abstract, but around concrete acts of speech. This was so the community of faith might be reconciled, that it might actually and physically exist. Nothing will destroy a community of faith faster than in-fighting and holding grudges. God has given us paths to wholeness, all part of the activity of the community of faith, not things we have to struggle with alone. The first path to wholeness is prayer. Two different types of prayer are addressed in our reading from James. The first is individual prayer such as the kind James calls the suffering to engage in for themselves. Some of us may be in some kind of trouble or we know someone who is having some kind of difficulty. God invites us to intercede for them. Intercessory prayer is simply praying for others. We see this as the elders pray for the sick and in the example of Elijah who prayed for draught followed by rain. There was a homebound woman in my first call in Portville. Her faith was very deep. Whenever I would visit her, she always let me know she was praying for me. If there was something I was especially struggling with, she would tell me she would especially be praying for that as well. Just knowing she was praying for me meant so much. Have you ever had someone like that in your life? If you’re not sure, look around. They are right here! When in good spirits, we are to sing songs of praise, which is yet another path to wholeness. Since praise is addressed to God, it too is a form of prayer. Although the origin of the quotation is uncertain, Martin Luther is often quoted as saying, “[One] who sings, prays twice.” When things are going well, it’s not that we should say, “Phew! Things are going pretty well, but I wonder when the other shoe is going to drop.” Instead, let us rejoice and sing praise to the Lord. Our personal prayers are often linked with thanksgiving for God’s gifts. We see this as we say grace before meals, bless the beauty of God’s creation, or appreciate the restored health of a loved one. Anointing the sick and prayer for healing is the path to wholeness with which we struggle with more than any other. I’m sure many of us have prayed for healing and the person has died or gotten worse. And of course, there are the hucksters who blame the lack of results on the sick’s lack of faith, which is a horrible misuse of scripture and power. What’s the problem? We prayed for healing and the person wasn’t healed. James wrote, “The prayer of faith will save the sick, and the Lord will raise them up” (v. 15). There are at least two meanings to this verse. When Jesus healed, he sometimes said, “Rise up and walk” and the sick one was made well and walked! But another meaning to “the Lord will raise them up” refers to the resurrection, which is, through the eyes of faith, the ultimate healing. “The prayer of faith” is a faithful prayer, a prayer that trusts God to answer the petition in God’s way. Such prayer is a communal event. The sick are not to simply pray by themselves, with an individual faith. The community of faith is to gather, which seems to be a certain dynamic of the understanding of healing. We will be doing this later on in today’s service. Healing can take many forms: physical healing, which has occurred in the lives of some. There is no other way to explain why they are still with us. Sometimes there is relational healing—within families, among friends and within a church. Sometimes there is spiritual healing when God comes into our lives and our sins are forgiven and we are made whole. The final path to wholeness laid out by James is truth-telling and retrieving. James closes his letter speaking of those who have wandered from the truth. To bring someone back from falsehood to truth, we have to be willing to tell the truth about the wanderer’s behavior, that they have gotten lost and need to be brought back. This is serious, death-defying work, which will “save the sinner’s soul from death” (v. 20). The point is for us to go in search of those at risk of being lost to the community of faith. We must go to them when they cannot or will not come to us. James then references that this act “will cover a multitude of sins.” Elsewhere we read in scripture that “Love covers a multitude of sins” (1 Peter 4:8). Can’t you see God’s people surrounding the one retrieved with that kind of love? It is not about emphasizing the wandering, but lovingly restoring the wanderer to the fold of Christ’s faith community. Throughout James, God was forming an alternative, intentional community of faith forged in the image of God. James wrote not only for the early Christians but for us as well so that we would see our sin and trouble and sickness in a new way, as occasions for God’s gifts of confession, intercession and healing. We can then be reconciled, renewed and whole. When we allow this work to happen in our corporate lives, making us whole as a faith community, we can bring healing to all those around us; and there are plenty of people with needs. Our theological language is meaningless apart from the practical ways it fosters the whole human experience, including the testimonies of those on the margins of society—orphans, widows, immigrants and those suffering in other ways. This week many were glued to their televisions, radios or online to watch the testimony given by Christine Blasey Ford, concerning her relationship with Brett Kavanaugh. This affected many victims of sexual abuse as it brought to mind their own experiences. No matter where you stand, Republican, Democrat, blue or red, can we be the kind of people who can comfort those who have suffered abuse in its various forms, including sexual abuse? As we learn more of sexual misconduct among clergy in the Catholic Church, will we stand with those whose lives have been destroyed because of people with power misusing their power to abuse the weak? I imagine there are a number of us that have our own stories of sexual abuse and exploitation in some form; whether it was at the hands of a relative, employer, coach, religious or some other kind of authority figure. We probably didn’t have anyone we could talk with about this because of the sense of guilt and shame we experienced. A number of years ago, when many of us were young, who would have believed us? God wants to heal us physically, mentally and emotionally. You are God’s beloved child and these other things that may have happened to you, do not define who you are. If you ever need to talk and pray, call me or a friend in which you can confide. The Book of Common Prayer, used by Episcopalians and Anglicans, has a saying, “As we pray, so we believe.” Our prayers as the community of faith shape the congregation and allow us to become more nearly the body of Christ. The community of faith that prays together, stays and grows together. When we pray together today, during the prayers of healing and those of intercession, God desires to heal us as individuals and as his body, the church. You may come forward for healing prayer, but you don’t have to. Our loving God still hears our cries for help and healing. 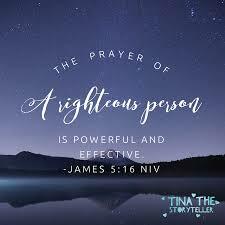 James’ emphasis on prayer demonstrates the significance and power of prayer. Prayer uniquely binds human and divine activity together in such a way that it is difficult to see where one ends and the other begins. Let us together exercise these spiritual practices so we may be reconciled, renewed and whole. May we be attentive to our words, treating each one as a prayer. James gives us concrete things to do, which as a congregation of doers, we can appreciate. We are to pray for one another, sing songs of praise, call for the elders, anoint with oil, confess to one another and bring the wanderers back home. It is through prayer that we are empowered to carry out Christ’s mission. It is something in which all ages can participate. Prayer changes relationships and lives. This week connect with someone who may have a need. Tell them that you will be praying for them and then do it. Keep track of what God does in their lives and your own. If you know the person well, pray with them when you contact them. “The prayer of the righteous is powerful and effective” (v. 16).